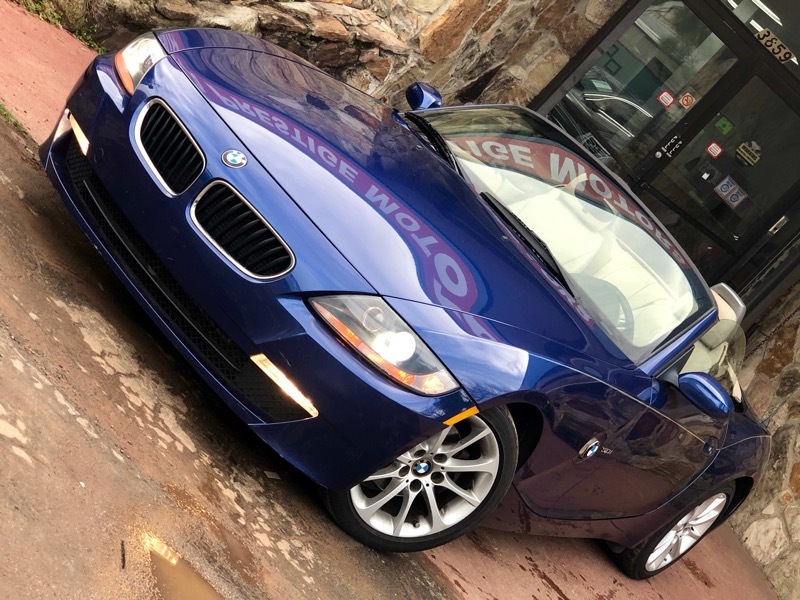 MUST SEE THIS SUPER CLEAN BMW Z4,NICE LOW MILEAGE,POWER SEATS,POWER CONVERTIBLE TOP,ADAPTIVE HID XENON LIGHTS,AUX PORT,PREMIUM SOUND SYSTEM,PREMIUM ALLOY WHEELS,RUNS AND DRIVES GREAT. Visit Atlanta Prestige Motors online at www.atlantaprestige.com to see more pictures of this vehicle or call us at 404-228-3700 today to schedule your test drive.EXTENDED WARRANTY,90 DAYS SAME AS CASH AND FINANCING AVAILABLE We take great pride in our continued growth by offering our customers excellent service, a knowledgeable and friendly sales and staff here at Atlanta Prestige Motors, and exceptional value with every purchase.Not all vehicles come with all the accessories such as extra keys, floor mats, remotes, etc. We will be happy to provide accessories for you at our wholesale dealer costs. We try to be very careful while listing options for vehicles in our advertisements, however, mistakes are possible therefore please call or email to confirm any specific option in the vehicle of your interest. Price and availability subject to change. Photos for illustration purposes only. Normal wear and tear should be anticipated. We are not responsible for any typographical errors.Since most our vehicles are located in 3 showrooms,to minimize your wait time,please Schedule Your test drive,Thank You For Visiting Our Website. EXTENDED WARRANTY,90 DAYS SAME AS CASH AND FINANCING AVAILABLE We take great pride in our continued growth by offering our customers excellent service, a knowledgeable and friendly sales and staff here at Atlanta Prestige Motors, and exceptional value with every purchase.Not all vehicles come with all the accessories such as extra keys, floor mats, remotes, etc. We will be happy to provide accessories for you at our wholesale dealer costs. We try to be very careful while listing options for vehicles in our advertisements, however, mistakes are possible therefore please call or email to confirm any specific option in the vehicle of your interest. Price and availability subject to change. Photos for illustration purposes only. Normal wear and tear should be anticipated. We are not responsible for any typographical errors.Since most our vehicles are located in 3 showrooms,to minimize your wait time,please Schedule Your test drive,Thank You For Visiting Our Website.